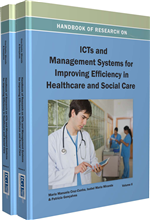 This chapter describes and discusses the applications and solutions under development or implemented in the e-Health care systems, in terms of their technological, social, organizational dimensions. A survey of the present status in relation with e-Government covers the leading countries (and not only) in ICT-based developments in these sectors. The authors present the most important solutions regarding the implementation and administration of a wide range of applications. Certain issues concerning EHR (Electronic Healthcare Record Systems), pharmacy and electronic prescription systems, patient administration and financial systems, intensive care unit systems, laboratory information systems, homecare and telecare applications, radiology information systems, and bioinformatics are outlined. Up and running ICT projects according to European Commission policies for health, ageing well, inclusion, and governance (FP7) are also presented. Healthcare and social care, regardless of their geographical location and sociopolitical environment, consist of three stakeholder groups (providers, supporting industry and governance) sharing the common aim of providing the best service to a fourth stakeholder group – the patients, as beneficiaries of this service (or consumers). Every stakeholder will have shared (often competing) values, expectations, needs, and challenges, which will finally form the growth drivers – or opponents – to the enablement of a common practice in these services. Improved access to care, improved patient safety, and cost savings are made possible through ICT investment in areas, which have a well-proven business case, such as Electronic Health Records, Clinical Decision Support, Electronic Transfer of Prescriptions, and Chronic Disease Management Systems, all sustained by a modern IT infrastructure. As the world’s population is ageing, healthcare system is facing one of its most important problems: it should support the current and future needs of the population it serves. Intensive Care Unit System (ICU): Hospital facility for care of critically ill patients at a more intensive level than is needed by other patients. Picture Archiving and Communication Systems (PACS): Electronic systems dedicated to acquiring, transmitting, and displaying radiological images and reports to referring physicians in a timely and reliable fashion. Laboratory Information Management Systems (LIMS) Software: Dedicated to help laboratories manage, organize and store large collections of data for rapid search and retrieval. Electronic Prescribing: Enables all stages of prescribing, medicine supply and claiming process to be completed electronically. Radiology Information System (RIS): System designed to offer operational workflow and business analysis within a radiology department. Bioinformatics: The application of computer technology to the management and analysis of biological data. Homecare: Different forms of health care service provided where a patient lives. Telemedicine: Generally refers to the use of communications and information technologies for the delivery of clinical care. Electronic Health Record System (EHR): Complex clinical information system, dedicated to collecting, storing, manipulating, and providing clinical information relevant to patient care activities (see above related terms as CPR, EMR, EHR, EPR).